« Day 50.5 in Beijing: A One Hour Special on From The Bay To Beijing on AM774.com! Day 51 in Beijing: Carry On Wayward Son! 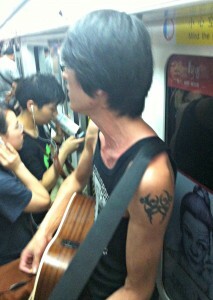 There are often buskers in the subways in San Francisco. They perform in the hallways leading to the subways. They rarely cruise on the subways and perform. Notice the woman on the left covering her ears and listening to her headphones. The subways in Beijing are a different story. You will often see musicians, such as this gentleman who was singing nice folk songs in Mandarin, jumping on the train, riding for a few stops, and asking for donations. Most are quiet talented and aren’t loud or obnoxious. I’m glad to say people aren’t blasting their distorted music from their phones which happens too often back home. The subway rides are usually quite peaceful and quiet. I find the buskers a very a nice distraction and quite enjoyable.